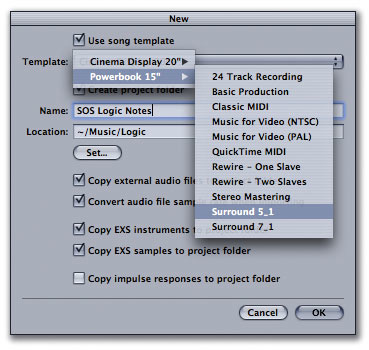 The facilities for surround sound in Logic Pro v7 are often overlooked, so here we take a peek at how to get going. By choosing the Surround 5.1 template, you cause Logic to create a pretty comprehensive set of audio and instrument tracks (all with surround sound panners) specifically for laptop or larger screens. Before we can go ahead and mix, we need to configure the outputs to connect with the appropriate speakers. By clicking on the Audio menu in the title bar and choosing Surround, the Surround Preferences appear, saving you having to go Logic Pro / Preferences / Audio / Surround. Immediately you are drawn to the routing matrix for up to nine speakers for more detailed surround-sound mixing — more of this in a moment. Working from the top of the pane downwards, the first drop-down menu labelled Show As restricts the configurable outputs on the routing matrix to the system you are working with, for example LCR (Left, Centre, and Right), Quadrophonic, 5.1 EX, Prologic, or other permutations. For the purposes of surround-sound music mixing we would commonly choose 5.1. Below this drop-down menu, there are three button choices for automatically routing Logic 's outputs to the respective speakers via your audio interface. These are set to three standards: the first, labelled Default, is Logic 's own preference (1 Left, 2 Right, 3 Left Surround, 4 Right Surround, 5 Centre, and 6 Subwoofer). Other choices include the ITU (International Telecommunications Union) standard used by many professionals, and the WG4 standard set by the DVD Forum for DVD-Audio. These three selections will route your 5.1 audio out of your audio interface in slightly different configurations and will therefore determine the connections you make to your amps and speakers. However, it is quite possible for you to alter the setup to suit whatever connections you have made to your speaker system by assigning each output from the individual drop-down menus. There are also options to customise the file extensions added to each of the audio files created when you bounce down your surround mix. There are two ways to get started. The first assumes you wish to start from scratch with a 5.1 or 7.1 session by selecting one of the Song templates offered to you as you start a new project. Choices include 5.1 and 7.1 setups for both 15-inch Powerbook and 20-inch Cinema displays. Logic handles surround-sound automation using Angle and Diversion parameters and Centre and LFE channel level controls.By choosing a template, the routing and surround panners are already provided for you on each channel, ready to go. You will notice that the group outputs remain as stereo pairs (1+2, 3+4, 5+6, and so forth), which is fine for Logic 's Default routing as 1+2 are Front Left and Right, and 3+4 are Surround Left and Right. However this then groups the output for the Centre and LFE (Low Frequency Effect — the subwoofer to you and me) channels, which may limit the way in which you handle the discrete surround-sound outputs. For example, you may wish to filter out any high frequencies emanating from the LFE buss, which would not be possible as part of a stereo group without affecting the other channel. Should you want to do this then it is easy to change this by deleting these stereo groups and following the procedure outlined below. The second way to get surrounded is to alter an existing stereo mix to output to your surround system. Presuming that your mixer and routing within Logic are quite standard, you are likely to have an output buss labelled Out 1-2. In order to talk to the surround-sound speaker system, we need to delete this buss and create some further Audio objects to represent each of the discrete outputs. To do this within the Environment page choose Audio Object from the page's New menu option. Repeat this five more times and label each one (Left, Right, Left Surround, Right Surround, Centre, LFE). Select each Audio object in turn and assign it to outputs one to six (this follows Logic 's own Default connections for surround as described earlier) or use your preferred configuration. Before expanding each channel to reveal the traditional channel strip, it is likely that you will not require all the parameters available to you. As such, select the six objects and untick the Show boxes in the Parameters. Next double-click the Audio objects to reveal their full strip. Now, should you need to tailor each of the outputs, you can add EQ and inserts as required by ticking the appropriate Show box. Monitoring control systems for surround sound are expensive devices, and are usually provided separately to that of your normal audio interface or mixing console — one example is the SPL Model 2380 we reviewed back in SOS August 2003. Fortunately, the recent addition of the Master Volume fader in Logic offers a solution to this, and will act as an overall volume control for your surround-sound system without you having to invest in any other hardware. To make your stereo mixer channels output to the surround mix busses, there are changes that need to be made. On the channel strip in Logic go to the output list, usually listed as Out 1-2, click this, and choose Surround. (This can be done somewhat faster for the whole mix by selecting all the channels you wish to change first and then pressing Alt when clicking to Surround). Automatically a surround-sound panner replaces the conventional stereo pan control, showing the space between the five full-range speakers. Within this sound stage a small circle denotes the intended destination of the sound, and the panning is managed accordingly for you. Double-clicking any of these surround panners brings up an enlarged version in its own window, within which there are two additional sliders for LFE and Centre levels. Pressing Apple when using the mouse in the surround sound panner allows you to lock your sound to a plane, for example front to back, or front left to rear right in a straight line. Pressing Control locks the distance from the centre and allows you to rotate around the centre on a fixed circumference. Double-clicking any of the channels' surround panners opens up a larger screen for more accurate control, and also allows you access to the LFE and Centre level faders. A drop-down menu at the top of the panner window lets you choose different output configurations.You might well ask why there's any need for a separate Centre level control. Well, in many applications of surround sound, such as film, the Centre speaker is often used for dialogue applications, therefore keeping the viewers' focus on the cinema screen and not on the left or right speakers depending on where you sit in the cinema. Music stems might be kept away from the Centre in this instance. By adding this control, you can manage whether the panner is controlling its centre image through the standard left and right speakers, or whether it feeds signal to the centre speaker for true 5.1 immersion. Another way of managing the Centre content is to choose the output configuration from the top of each of the enlarged panner windows. This can be restricted to '5.1 w/o Centre', which will omit the Centre feed and spread the signal at the front between left and right speakers, as in a traditional stereo system. Surround-sound automation is handled in a similar way to the automation of any other control in Logic. By changing the status of the automation mode on the channel strip to Write, Touch, or Latch, Logic will respond to any panner movements you make as the track plays. Again it is better to open the larger panner window for more accurate placement. 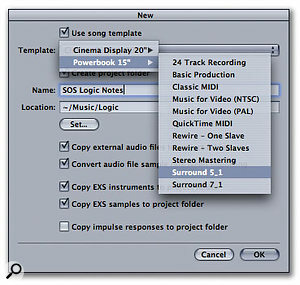 These moves can be edited later using the Display Track Automation menu option in the Arrange page, which shows the surround-sound options for close scrutiny. 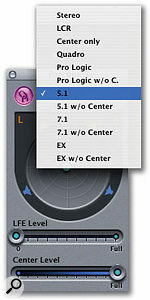 Logic offers four automatable parameters, Angle, Diversion, and LFE and Centre levels. The Angle parameter positions the sound around the five speakers, whilst Diversion dictates how far from the centre 'sweet spot' the sound is drawn away. The LFE fader is provided so that you may manage the amount of content sent to the subwoofer independently. For example, in a band recording you may only wish for the bass drum and the bass guitar to be fed in part to the LFE, keeping the bottom end clear of things like synth parts which contain frequencies that sometimes go that low and cloud the mix. The Low Frequency Effect channel is the '.1' part of 5.1, and offers you the ability to add rumble to your film soundtrack, or deep bass to a music mix. The use of the subwoofer might be dictated by your monitoring system, and should not be confused with the LFE channel. It is intended that in a true 5.1 system all five speakers should be pretty much full range, while the subwoofer acts only as a sub-100Hz driver used for special effect — such as when a jumbo jet flies past in the film. In this instance the '.1' channel is intended to receive only information on this channel. However, in monitoring systems for music the subwoofer is often used to improve the bass extension of smaller nearfield monitors, and in some surround monitoring systems bass from the five main channels may also be redirected to the LFE as well for this reason. Be sure that you understand how your monitoring system is handling the bass end, and use the LFE channel for the extra bass only when necessary. The next question is how you finalise your surround-sound mixes for mastering. Bouncing for surround sound is just as easy as it is for stereo. 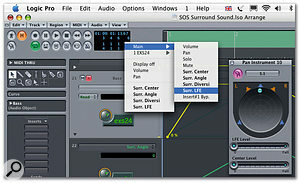 Just select the Bnce button from one of the newly created output-buss Audio objects or select Bounce from the File menu. 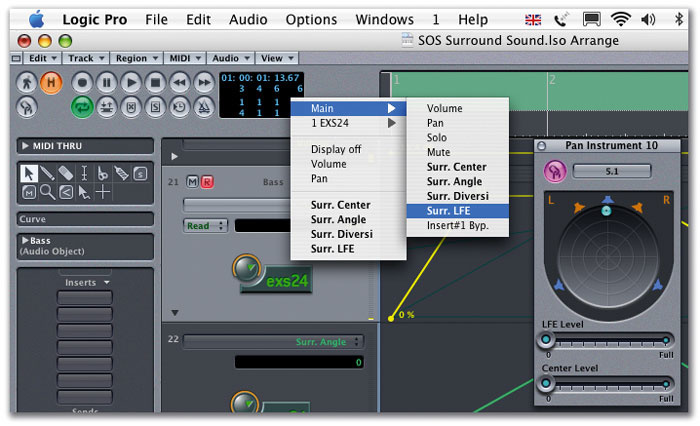 The same dialogue box will appear as when doing stereo bounces, so you will need to change the 'surround bounce' drop-down menu to the variety of surround you want, in this case 5.1. Notice that the file-size information at the bottom of the page changes according to the format chosen. Your six files can then be burnt to a CD or DVD for mastering to AC3 or another format. Straight out of the box, Logic provides fantastic facilities for producing polished surround mixes for a wide range of applications. Surround is clearly here to stay, so perhaps it's time to have a go for yourself. One of the surprise features introduced by Apple with Logic v7.2 was direct support for Serato's highly regarded Pitch 'n Time plug-in. This program has long been in use in the Pro Tools TDM world for high-quality manipulation of the pitch and tempo of audio, and its relatively high cost has been justified by the speed and quality of the results obtainable. The announcement that a version was being made available for Logic was a pretty mouth-watering one; a dribble that turned to a torrent when rumours surfaced that the proposed price would be just $99 as opposed to TDM's hefty $799. As it turns out, when the product was finally released, its price was set at a more logical $399. This is still something of a bargain, though it does come with the caveat that you'll need an iLok security dongle to use the program. If you have an iLok already, there's a demo version of the software on Serato's web site, along with audio-only examples for the dongle-less. There's been a modicum of confusion as to the program's implementation under Logic. Although it's technically an Audio Unit plug-in, it actually appears as an extra algorithm in the Arrange page's Audio menu and in the Time Machine, so you use it in exactly the same way as you would Logic 's own pitch- and tempo-manipulation features. Interestingly, it's not just Serato that Apple have allowed to access Logic 's pitch and time core; Izotope, makers of the excellent Ozone mastering suite, have announced Radius, a plug-in which integrates into Logic in exactly the same way as Pitch 'n Time. It's slightly cheaper than Serato's offering (at least for the first few months), doesn't require an iLok, and you can try the demo out at their web site. The opening of Logic 's core to third-party software houses is an interesting move, and we can hope that other manufacturers take advantage. Of course, many of us are wondering why we have to pay extra for high-quality pitch- and time-manipulation anyway, when other programs, notably Ableton's Live, already have it as an integral part of the software. However, the thought of Celemony's Melodyne pitch-processing algorithms possibly becoming available for use directly in Logic 's Time Machine is certainly an exciting prospect.